The NHL was in expansion mode for the 1972-73 season, and so was 1972-73 O-Pee-Chee Hockey. For the season, two new teams hit the ice, a new league appeared and OPC expanded its hockey set to 340 cards, which made it the largest hockey set the company had ever offered to that point. 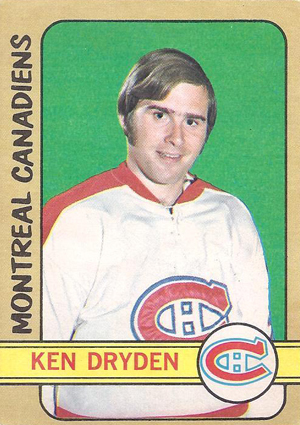 1972-73 O-Pee-Chee Hockey card fronts featured a player picture superimposed over a solid-colored background. A yellow stripe running below the picture features the player's name and a team logo. The team name runs vertically up the left side of the card. The area around the picture is entirely tan, which is an unusual color choice that works well. An orange stripe runs across the back at the top and gives the card number as well as the player's name and position. A separate orange block at the left side contains vital stats and a cartoon about the player. A bilingual biography and year-by-year statistics fill out the remainder of the card. The 1972-73 O-Pee-Chee Hockey set includes players from the first-year Atlanta Flames and New York Islanders. The set was issued in four series. The first series runs from cards 1 through 110 and the second includes 111 through 209. Each of these series is relatively plentiful and includes 22 double-printed cards. Series three contains cards 210 through 289 and is slightly scarcer, while the fourth series runs from cards 290 through 340. It features players from the newly-formed WHA and was printed in much smaller quantities than the rest of the set. There are also three checklist cards. There are a number of In Action cards that are scattered throughout the set. Six playoff cards are seeded throughout the first series. The third series contains several cards of the previous season's NHL statistical leaders, while first-team All-Stars take cards 226 through 230 and second-team players show up on cards 247 through 250. There are also three variations: cards 48 and 85 are found with different positions and the final checklist card can be found either with a complete list or with the last several cards listed as More WHA Stars. Despite featuring new NHL teams and a new league, there are no notable rookie cards featured in 1972-73 O-Pee-Chee Hockey. 1972-73 O-Pee-Chee #318 Ron Climie *High Number* (NRMT) Ottawa Nationals !! 1972-73 O-Pee-Chee #313 Joe Szura *High Number* (NRMT+) Los Angeles Sharks !! 1972-73 O-Pee-Chee #314 George Morrison *High No* (NMMT) Fighting Saints !! 1972-73 O-Pee-Chee #315 Wayne Rivers *High Number* (EXMT) New York Raiders !! 1972-73 O-Pee-Chee #316 Reg Flemming *High Number* (NRMT+) Chicago Cougars !! 1972-73 O-Pee-Chee #317 Larry Hornung *High Number* (NRMT) Winnipeg Jets !! 1972-73 O-Pee-Chee #319 Val Fonteyne *High No* (NRMT NRMT+) Alberta Oilers !! 340 cards. Card 208 does not exist.